As I entered the little café set in the hills the wee lady greeted me with the biggest smile; “How are you today?” she asked kindly and warmly, as she looked deeply into my eyes. I felt she genuinely wanted to know the answer. I’d just crossed the bridge from mainland Scotland onto the beautiful Isle of Skye. The stunning scenery had truly made me appreciate the meaning behind, ‘taking your breath away’; and I’d only been on the island fifteen minutes. Little did I know how this magical spot would transform my being. From here, I could write a book on the joys I experienced on this wondrous Isle over the following four days. But for now, here are my happiness highlights. First up: the Awe Walk. 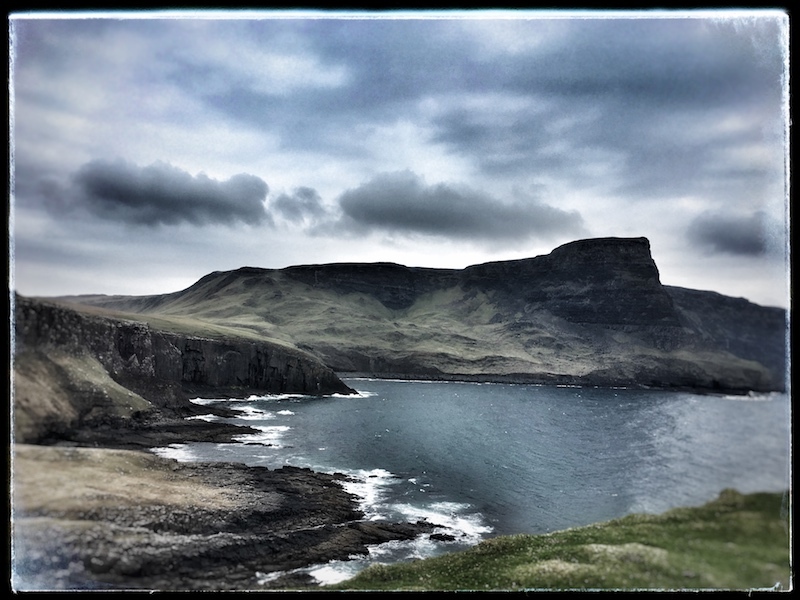 Well Skye was a never-ending journey of sheer awe at the raw beauty of the land, sea, lochs and sky. I’d forgotten how far removed from nature I had become living in London, and in a matter of only hours of connecting to this beautiful countryside I felt like a different person. I had been touched deeply, to my core. Melanie Rudd from Stamford University and her colleagues have investigated how we’re affected when we feel awe. Their research found that these experiences give us greater life satisfaction, make us more patient, more willing to volunteer and actually make us feel like we have more time available to us. It’s incredible the impact it has. Observation two: the mobile phone. I could feel the sheer panic rise inside me as I glanced at the ‘NO BARS / 3G’ on my phone. No worries, wifi will appear soon… or not as the case may be. Neither the café nor my hotel had service and, as the nausea lurched inside me and I thought, ‘how can I contact the people I need to,’ yet another friendly smile handed me a phone. Use the landline – call anyone you need to. That sentence made me think – who did I really need to phone; this was someone else’s bill, and I should be quick. And then I realised, well actually one call to the crew and one call to my Mum to let her know I’m safe, and that would suffice. The rest I didn’t need to contact at all. I just thought I did. I’d become addicted to my phone, this was for sure, as my brain raced at all the things I couldn’t check and be prepared for: weather, routes, local eateries, scenery. The panic lurched again. Until the next smile arrived: ‘Let me tell you all about the island and what you might want to know’. Who needs a mobile when you have kind eyes, and someone who knows every inch of their own terrain, sharing their stories and wisdom with you? As I climbed into bed that first night it felt strange not being ‘connected’ to my parents back home, my friends, the worldwide web. I won’t get used to this I thought. I was wrong. By midday the next day I had already adjusted. There was the odd moment when I reached for it, “What is the technical difference between a hill and a mountain,” I asked Tim as we went to google it and I annoyingly requested an accurate definition of each! But for the most part to be without connection was a sheer joy. It enabled me instead to live in the moment, to connect to the nature, to connect to the people, and to just stop and be. My heart sang and I felt at peace. So I would like to say thank you to Skye and its wonderful inhabitants for the magic I experienced last weekend. Every single person I met from that first wee lady onwards, smiled, looked me in the eyes, asked me how I was and wanted to truly connect and share the history and beauty of their Isle. Each and every car said thank you as they passed. And kindness, consideration, patience and warmth abounded everywhere I went. Some could say I was just lucky. I would say from my trip it was the ethos of the Isle. I shall be back. I shall be turning my phone off more. I shall be seeking out beautiful nature. And I will most certainly be smiling at all who pass my way. WOWSER ! ! ! . Great stuff Sally , wish I could have shared your trip to Skye , but reading about it was good , thank you . More , and more , and more , power to your elbow , oh Head of Happyness ! Thanks for the phone call . See you in the merry month of May , Yeah ! I’ve been to Skye many times, I’m very envious of the life style! We have returned again and again because of the friendliness of the people and a need to ground ourselves away from our phones, laptops etc! It helps the views are breath taking….an Isle where you can truly find peace!